What is your weather cancellation policy? If inclement weather causes us to cancel class, you will receive a credit in the amount that you paid for your class seat that can be applied towards a seat in a future public class of your choice. You also may request a refund via email up to 24 hours past the start time of the canceled class. No refunds will occur if your request is not received via email 24 hours after the scheduled class. If our studio is open and you choose to not come to class due to inclement weather in your area, we will issue you a complimentary credit in the amount you paid for your seats for your use toward seats at any other public class up to 30 days from the date of original class. You must request the hold via email at least 4 hours prior to the start of the original class. No dress code here…dress casual or dress up. We will provide you with an apron, but a word of caution - unless a splatter is caught quickly, acrylic paint typically does not wash out of clothing. All you need to bring is a smile. We provide the canvas, easel, brushes, paints and apron for the class. We also provide a fun menu of wines, beer, soft drinks and, on occassion, specialty cocktails for purchase. (Note we are not BYOB.) Feel free to bring your own snacks. 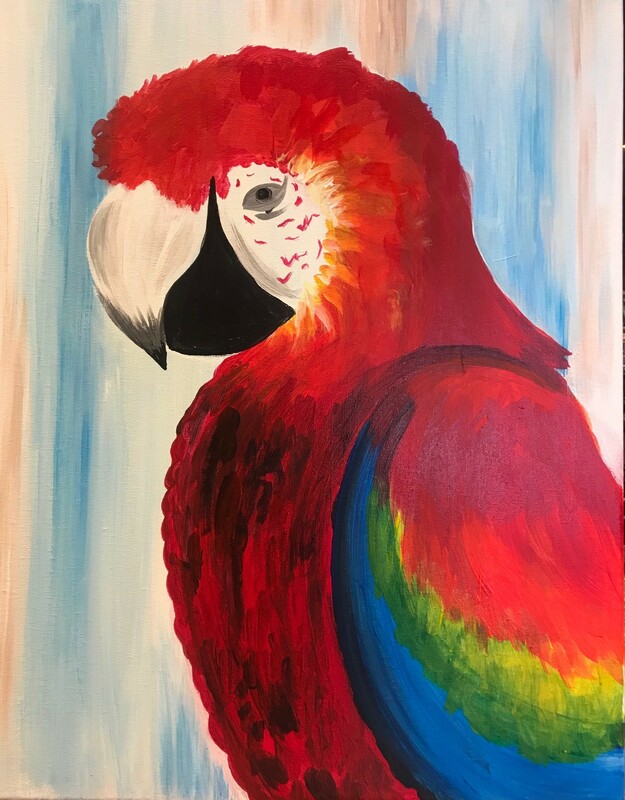 We recommend you arrive 15 to 30 minutes before class starts to allow time for you to get settled in, enjoy a drink and mingle with friends before the painting starts. Painting begins promptly at the designated time. If you are late, we will do our best to catch you up. Guests who arrive more than 15 minutes late may not be permitted to join a class in progress. IF YOU ARE ATTENDING AN OPEN STUDIO, you can arrive after the session's start time (usually noon) and not later than 90 minutes before the end of the session (3:30 pm for a session ending at 5 pm). Arrivals within the 90-minute period before the end of the session may not be permitted to participate in that session. Is there an age limit for the regular adult classes? Yes, you must be at least 18 years of age for our public classes other than Family Day or Little Brushes classes (see Reservation Terms and Conditions about children ages 12 to 17). During Family Day and Little Brushes classes, usually only non-alcoholic beverages are available at the bar.